Dr. Kelly Shaw graduated with his dental degree from the University of the Pacific in 1983. Prior to studying at dental school he attended and graduated from Long Beach State University with a B.S degree in Marine Biology. Dr. Shaw has been practicing for over 35 years. He has been in his current location Kailua-Kona since 2004. Dr. Shaw also advanced post doctoral training at L.V.I training in endodontics and a mini residency in dental implants. 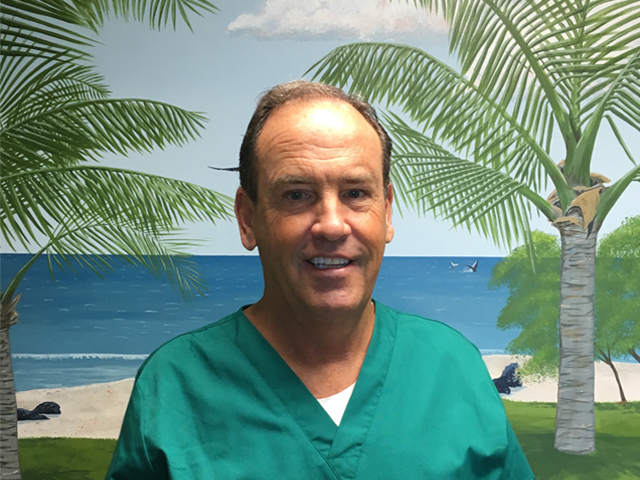 Since he began practicing dentistry Dr. Shaw has kept up to date on many continuing educational classes, ensuring that his patients receive the most comprehensive and advanced dental care. Dr. Shaw has been married to his wife for over 35 years and they have 3 children together. Ted who lives in Oahu and works for HECO, Katie who is a physical therapist for Kaiser in Hilo and Nick is going to college in California. In his spare Dr Shaw enjoys spending time with his family and friends. Also he enjoys surfing, hiking, biking and diving.